Yesterday I was not feeling well. Did not make an appearance at the WP Open Mic. When no other words will do. HOLLYWOOD has been boosting sales in a very unlikely area: poetry books. Sales of two poetry books, one by Elizabeth Bishop and another by E.E. Cummings, more than doubled in some stores in the last month after actress Cameron Diaz read works by the two great American poets in the movie "In Her Shoes." The last book... I picked it up at Barnes & Noble yesterday while browsing there with my wife. Cathy brought it to me and I flipped through it and proclaimed it a gem! The irony of this is that poetry is not really her thing. It has a really good and quite varied selection from a number of very outstanding journals. That I recall off the top of my head - The Hudson Review, Poetry, Sycamore Review, Slate, Ploughshares, New Letters, 32 Poems, Fence and of course The New Yorker and Atlantic Monthly just to name a few. So, what's on your night stand? I'm presently working on a self-portrait poem - hence I found this quote to be relevant. As I was journaling this morning, an idea came to me that I was intrigued by. I was thinking about all the drafts of poems that I have started and squiggled lines through short phrases that once on the page, I decided did not work. There are many such aborted word clusters that litter the pages of my writing journals. They are at minimum, short thoughts that were cast off as unacceptable for one reason or the other. I was sort of viewing them today as like "out takes" from a film. I am presently working on a draft of a poem that represents an abstract self-portrait. I suppose it was such abstract thinking that allowed me to toy with the idea of creating a poem from these cast off lines from various different poetic efforts. I have of course, in the past, recycled lines that I thought were good but did not work in a particular poem. But this is something different. This is about using only discarded poem parts to create a whole. So I am noting this here as a reminder in the weeks to come to spend some time on this as a new project. Something to do on a rainy day. I suppose this is probably not original. Anyone else out there tried this? 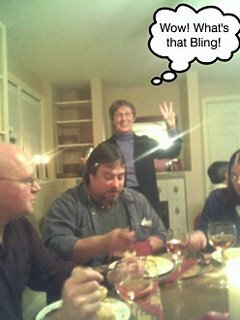 KC Metro Verse - celebrated Thanksgiving at the WriterHouse last night. Seen at the left, Pat Berge (squinting from the reflection) is showing how many thanksgivings this group of writers has endured together. Great crowd - I'm remembering a number of something like I think 16 or 17 people. I did have some wine, so don't hold me to the number. The KC Metro Verse chapter of the Missouri State Poetry Society & members of the Northland Writers (of which there is some cross-membership) made up bulk of the crowd with a few guests. After dinner we gathered in circle for readings. Mostly poems written by members - but a few by established poets like Collins and Fairchild. Pat had the WriterHouse looking elegant. Linens on the table, candles lit everywhere. The atmosphere was so amiable throughout the house. Makes it had to wait for the Christmas even on December 22 this year. Of course here is Cheney in a speech at the American Enterprise Institute. "Disagreement, argument and debate are the essence of democracy. What is not legitimate and what I will again say is dishonest and reprehensible is the suggestion by some U.S. Senators that the President of the United States or any member of his administration purposely misled the American people on pre-war intelligence." Perhaps he need to revisit his own actions in the video. The war in Iraq cost U.S. Taxpayers $266.7 million dollars for today alone. None of it in the federal budget. Our children will be paying for this lie. Recently Ivy posted links to here and here. These two links tell the story of a town - Peterborough, N.H. to be exact that is Demanding taxes from Long-Exempt Artists' Colony know as the MacDowell Colony. MacDowell I recollect has been around something like 100 years. Ivy of course has a special connection to the Colony as she did a fellowship there last year. Now I see an interesting piece about charitable giving and find that New Hampshire was the most miserly state, according to the Catalogue of Philanthropy's Generosity Index. So maybe after a hundred years, we should have seen it coming. I saw were the 2005 International Poetry Festival was held in Wellington, New Zealand for the third time and drew a disappointing crowd in spite of having attracted an impressive list of sponsors. The centerpiece of the event this year was a documentary film called "Poetry in Wartime", introduced by Sam Hamill, who features in the film and who has founded a worldwide movement, Poets Against War, which now has centers in over thirty countries around the world and membership in the tens of thousands. I have to wonder if it is time for the International festival to be hosted in another country. Could the U.S. had done better in attracting participants? Geraldine R. Dodge Poetry Festival has been such a big success that it has outgrown the most recent location and is having to move as a result of an inability to gain commitments for greater facilities. Tonight, Robert Stewart will read poetry at The Writers Place. Mr. Stewart is editor-in-chief of New Letters , New Letters on the Air, and BkMk Press at the University of Missouri-Kansas City, where he also teaches. The Program will start at 7:30pm. I'm not sure what it is. Doubt or simply being tired or frustration. Perhaps it is only a rebellious nature that wants to open the car door and drag my toes along the gravel road to slow down. Every now and then I get this feeling like- AUGH! I not going to write again. Then of course it goes away. Sometimes this last for couple of days. Sometime less. Yesterday, it came and went in a very brief matter of 30 to 45 minutes. Hardly worth mentioning. Except that fact that it was so noticeable and gone almost the next instant seems to make the occurrence in some ways all the more significant. Or at least interesting. So, I mention it here. It will likely sit in the back of my mind as well. At least until it occurs again and then... who knows what I'll do. Probably write. ...at bringing civil war to Iraq? I just love this op-ed piece. Living so close to Kansas and seeing the battle rage there I just shake my head and.... well, we won't go there. Pulitzer Prize winner W.S. Merwin, did in fact receive the poetry award for his book, "Migration" at the National Book Awards last night. The Moderate Voice - Murtha's Anti-War Comments: A Turning Point In More Ways Than One? Good piece - and while this is significant news, I think the President Bush and Vice President Cheney lost middle-America on this many months ago. It is just now hitting home with lawmakers in both parties - slowly, but they are starting to catch on. The two most important are just "really slow" and besides that, in self-denial. Meanwhile - A former CIA director - torture is condoned and even approved by the Bush government. Should Merwin win, it will end a seven National Book Awards (NBA) nomination losing streak for the poet. His last nomination was in 1975. Sam Hamill, co-founder of Copper Canyon, who published the work, called Migration a was a sure candidate for the NBA. Typically a poetry book might sell 1,000 copies. Copper Canyon Press has already sold 6,500 copies of it. Wow! If I might be allowed one word of editorialzing. Vice President Cheney scolds war critics. He has joined President Bush in once again seeking to pin a mark of disloyalty or lack of patriotism on those who take issue with the American foreign policy that has taken us into the war in Iraq. The President and Vice President have attempted in the past few days to frame this in the context of a partisan battle with Democrats. In lashing out at Democrats on this issue they are ignoring the fact that there is no broad support for the Iraq War any longer. 52% of America says the war in Iraq was not worth it. 57% believe the President misled the country about prewar intelligence. That is nearly 6 out of ever 10 people. Conversely only 35% believe he did not mislead us. 58% believe the president has not given us good reasons to keep the troops there. The opposition to the his war is not partisan. If he wants to continue to frame it in that contest, he is only kidding himself. This week - Senator Chuck Hagel said, "The Bush administration must understand that each American has a right to question our policies in Iraq and elsewhere and should not be demonstrate and condemned for disagreeing with them." Senator Hagel is from Bush's own party. In fact, this week the Senate on a vote of 79 to 19 sent a strong message to the President about their concern for this war. Such a vote clearly shows that there is broad concern about this war in the Senate and not just from Democrats. If the President and Vice President believe they can shore up support for Iraq with this kind of talk they are (putting it politely) naive. There is nothing to come back from. The American people have seen enough and they are not buying this war or the lame excuses (whichever one) Bush and Cheney choose to use today. And when they question the loyalty or patriotism of certain Democrats because of their opposition, then they are questioning the loyalty and patriotism of six out of 10 Americans. That kind rudeness isn't going to buy anyone political capital, respect or a cup of coffee. Herald Sun: Torture bunker busted [17nov05]: "IRAQ'S new security forces have been accused of routinely abusing and torturing detainees the same way Saddam Hussein's brutal regime did. A gruesome discovery in Iraq... more than 170 tortured and starving prisoners in a locked Interior Ministry bunker beneath Baghdad. US troops stumbled on it while searching for a missing boy. A spokesman for the division of the multinational force in Iraq responsible for training the Iraqi police reportedly said, "This sort of behavior completely undermines everything the Iraqi Government stands for and everything the coalition came here for, It is unacceptable in any form." He might want to check higher up with say, Vice President Cheney. This is the culture that Bush / Cheney / Rumsfield are exporting to the world. This is the very example that they are setting and it is against this backdrop that both the new regime in Baghdad and the United States will be judged by the world. Even all but 9 members of the Senate recognized recently. Now comes more disturbing news... Is the United States using chemical weapons in Iraq? Is White phosphorus a conventional weapon? How appropriate my last post with the Dickinson verse "A little this side of the snow" because it was indeed a wee-little this side of it. The white stuff is falling here today! The are big husky flakes that look like they could be on steroids. Fortunately for the time being it is not sticking. I am listening to Schubert - Symphony No. 5 - finale on xm satellite radio - presently and have taken a pause from my work to have diet drink and post this morning's blog. The air has chilled a bit - was nice earlier. My daughter Meg and I did the leaf thing in the front yard. I say the leaf thing because we didn't really rake as much as we sucked them up into bags all nicely mulched. It beats the hell out of raking when you have a lot. Saturday and today I have created two new poem drafts which I am most happy with - they will require a bit of tweeking but not likely too much. It is a nice feeling when you have more then one come together nicely in a span of two partial days of work. I read the New Yorker article from the November 7th issue by Larissa MacFarquhar on John Ashbery. What an astounding profile. I enjoyed every bit of it. Speaking of Ashbery - I was reading a few of his poems and I especially like Paradoxes and Oxymorons from his book Shadow Train. Solid, like a good hard mahogany table. And I miss the cicada sound. 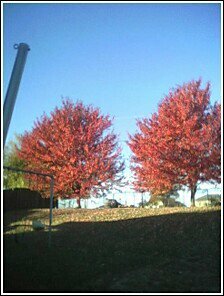 The two Maples from our backyard that a promised a week to ten days ago. Isn't this time of year really all about color? The brilliance on one hand counterbalanced with the browning and graying. At least that is where I find the beauty of the fall season. I have to look for the good in it... I miss baseball. I do enjoy the cooler days - but not the shortened daylight. But ah! Spring will come again! That is the greatest thing about spring - that eternal hope it represents. When I think about hope and poetry together, I immediately think of Sam Hamill. I was delighted to hear that Sam was honored yesterday with the PEN USA Freedom to Write First Amendment Award. The First Amendment Award is presented to an individual who has demonstrated exceptional courage in defending freedom of expression in the United States. In my humble view, Sam's contributions to the literary community, the causes of justice and peace, and bringing the two together in one powerful voice is a tremendously unselfish act that poets, writers, essayists and indeed people of all walks of life would do well to aspire to. You can find out more about PEN USA here. "Thank you for your submission. Although we are not able to publish your work at this time, please be assured that we value your submission." Much more work to harvest. Writing poetry has so much in common with gardening. Working the soil and pruning the plants. Nurturing them along. 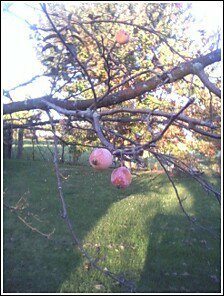 I'm thinking now about this years crop. Has it been better then the previous year? In volume? In quality? Things to think about as the final quarter of the year slips past us. *not to be confused with "four letter words"
I'll admit that I have found articles exploring the thought process of creative individuals very absorbing. I'm always interested in new twists and thoughts on the age old debates about creative people and their mental status. This time, I found the article more amusing then informative. Maybe Dr. Hendricks work is quite serious and scholarly. Perhaps it is the writer Geoff Strong and his choice of words that I find humorous but this piece really has me cracked up. Starting off with the opening line... "Know any creative types: writers, painters, musicians, actors? Chances are they tend to be contrary, a touch psychotic and rebels, cause or not." I'm sucked in. I'm immediately in my self-analytical phase - picturing myself deeply indented into a black leather couch asking myself...Am I a rebel or just a cranky old man? Cause? You want causes? Hell, I got causes out the wazoo! Ok, seriously... I'm off the couch and thinking about this article. The good doctor has decided that "all people who are creative tend to have schizo-type personalities." That is what the article says. Not some or most, but all. She has also found distinct differences between the three groups (writers, visual artists and performance artists). Writers had the most extreme personality disorders - more neurotic and less agreeable "they are more at odds with the world. Visual artists - are the closest to normal (whatever the hell that may be) though still more deviant than normal personalities. performance Artists - were the most likely to want to experience new sensations and novelties, and were also the most narcissistic. So let me get this straight, it is because I'm a writer that I am at odds with the world? Gee, and I thought it was just because of the deep rooted corruption in government and the fact that we have a President who is a moronic mad man and a Vice President who is heavy into torture. I loved the part in the article about how the doctor tested the groups of people by giving them problems to solve to see if their solutions were conventional or divergent. The example was showing them a brick and asking them to suggest possible uses. A non artist would for example say - building things. Artists were more likely to suggest it could be thrown through a window (At Dr. Hendricks office) - notice how I immediately think like an artist here. So here we are with nine... any more wordsmiths out there that want to build on this list? A number of us from one of my writing communities attended the wedding of fellow poet/writer Scot Isom and his wife Dena last night. Best wishes to the new couple! I cringed just a bit when I saw in the program there was a reading of one of Scot's poems. I thought... he has one clean enough to read? Luckily he wrote one just for the occasion. It is feeling so strange now without baseball. That is one aspect of fall that I hate. All the fun colors and enticing smells we come to think of with this time of year still come up short without baseball. I have been using a full spectrum lamp at both home and the office of late. I do believe it truly helps with respect to SAD. Plus the light is so much better to read by. Our cats love to curl up and sleep beneath the one at home. Catching a few rays. Falling in love again and again - the lost poetry of Dietrich - World - Times Online: "Falling in love again and again - the lost poetry of Dietrich"
From her Paris hotel room, Marlene Dietrich would set at a typewriter to tap out poems to dead lovers. Among them, Ernest Hemingway and Yul Brynner, and Ronald Reagan. Thirteen years after her death the poems were discovered. They represent quite a find - telling a great deal about her reclusive years. Fascinating in that while Dietrich is certainly of celebrity status, she represents a virtual unknown in the literary world. Evidently, poetry did matter to her in her late life. -- Michael Brown e-mailed the day of the storm. Funny but I don't believe that is exactly why most people wanted to vomit. An early morning view from my back yard into a neighboring yard. 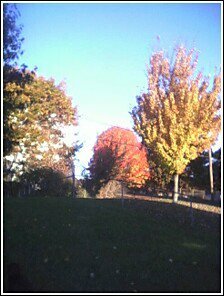 I am awaiting the turning of the two maples in our own yard. They are just starting - I'm guessing within a week they will be awesome. This is one of those things that makes you laugh and cry at the same time. Picture FOX ( our Fair and Balanced friends) news reporting on Slavery, Christ's crucifixion, Boston Tea Party, Kent State massacre, and more.